Founded by Steve Fallon and Bill Ryan in 1982, the esteemed New Jersey-based indie-rock label Coyote Records* was, perhaps, the hottest East Coast imprint during the decade (sorry Gerard…). Coyote released albums by such acclaimed and influential artists as Yo La Tengo, The Feelies, Beat Rodeo, Chris Stamey of the dBs, and New Jersey’s favorite sons, Speed the Plough. A 1985 compilation album of Coyote label acts titled Luxury Condos Coming To Your Neighborhood Soon has since become a sought-after, premium-priced collectors’ item. Fallon was also the owner of the legendary Hoboken NJ club Maxwell’s, which was a destination venue for such college-radio-ready performers as Husker Du, the Replacements, and R.E.M. among many others. Fallon also supported NY/NJ area artists who came to define the “Hoboken Sound” of the late 1980s and early ‘90s, a scene well-documented in the pages of Jim Testa’s Jersey Beat music zine (full disclosure: the Reverend contributed album reviews to Jersey Beat for years). “At the time, a lot of the bands who I became close to through Maxwell’s were struggling to find record labels to put out their first releases,” Fallon says in a press release for the revived label. “So I thought I could help and that's basically why I started Coyote. Of course, the most important thing was that I really liked the music they were making.” Coyote released dozens of albums and singles during the ten years it was in business, with Fallon closing the doors in 1993 and selling his interest in Maxwell’s a few months later. Nevertheless, Fallon was still interested in music and – inspired, perhaps, by young fans buying vinyl records from his Delaware-based store Gidget’s Gadgets – Fallon will resurrect Coyote Records on a limited basis with the December release of a new album by veteran Jersey rockers Speed the Plough. Titled Now, the twelve-song collection was recorded in 2014 and early 2015 and will be the band’s first album since 2011’s Shine. 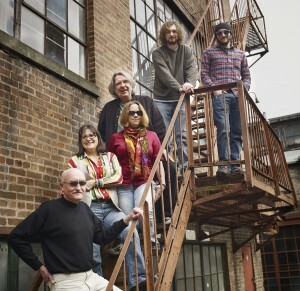 Formed by John and Toni Baumgartner and Marc Francia in 1984, Speed the Plough has featured numerous band line-ups through the years, its roster including Stanley Demeski and Brenda Sauter of the Feelies, and well-known rock critic Jim DeRogatis (another Jersey Beat alumnus), among others. STP released four full-length albums on the East Side Digital label, beginning with 1989’s self-titled debut and ending with 1995’s Marina, all featuring band’s high-energy jangle-pop sound. The Baumgartners reformed Speed the Plough in 2009 and have been going strong ever since. The band's return to Coyote Records – the label which released their earliest recordings – should be a nice fit for both. * Fallon’s Coyote Records should not be confused with either the U.K. record label or Russian metal label of the same name.